Is your carpet haunted. just like mine is? 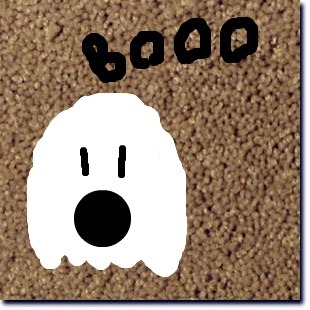 Carpet ghosts are indentations left by heavy furniture in the carpet, when resting in one place for a long time. These "ghosts" are most prevalent when the carpet pile is high, and can be a nuisance when you move furniture around in a room. So, how to exorcise your rugs of these apparitions? Here's a remedy from Martha Stewart (or, some random lady who works for Martha, who comes up with home repair advice...). 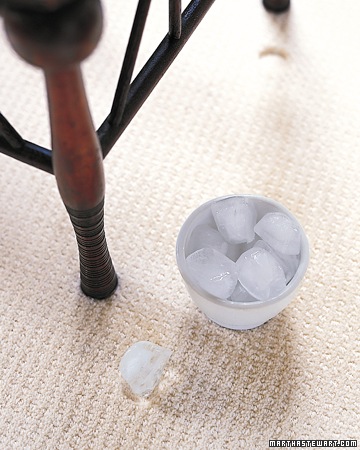 Place ice cubes on the indentations and allow the carpet fibers to swell as they absorb the water. Once the cube has melted, vacuum up the wet spots- the sucking action of a vacuum will pull carpet fibers back into their natural shape.